NOTE: Detailed lineage information for Air Base Communications, Airways Detachment, Medical, Ordnance, Quartermaster, and Signal units is located on those units' pages. Remarks: This command was organized as the Air Corps Provisional Maintenance Command, 15 March 1941, with headquarters at Patterson Field, Ohio; then reorganized as Air Service Command. After the war started it became Air Technical Service Command with considerably expanded functions. It was "housekeeper" for the combat elements overseas, and was responsible for the distribution and installation of newer-type mechanical airborne equipment. ASC technicians served on all fronts repairing and modifying aircraft. During the war, maintenance was divided into four echelons, distinguished from one another by the amount of work, equipment, and manpower required. 1st Echelon: That maintenance performed by the air echelon of the combat unit. 2d Echelon: That maintenance performed by the ground echelon of the combat unit, air base squadrons, and airways detachments. 3d Echelon: That maintenance performed by service groups and subdepots. 4th Echelon: That maintenance performed by air depots groups and at depots. First echelon maintenance will normally consist of servicing airplanes and airplane equipment, preflight and daily inspections, and minor repairs, adjustments, and replacements. All essential tools and equipment must be transportable by air. Second echelon maintenance will normally consist of servicing airplanes and airplane equipment, performance of the periodic preventative inspections and such adjustments, repairs, and replacements as may be accomplished by the use of hand to the combat unit. This includes engine change when the organization concerned is at the location where the change is required, Most of the tools and equipment for 2d echelon can be transported by air; but certain items, such as transportation, radio, etc., necessitate ground means of transportation. Third echelon of maintenance embraces repairs and replacements requiring mobile machinery and other equipment of such weight and bulk that ground means of transport is necessary. Units charged with this echelon of maintenance require specialized mechanics. This echelon includes field repairs and salvage, removal and replacement of major unit assemblies, fabrication of minor parts and minor repairs to aircraft structures and equipment. Normally, this echelon embraces repairs which can be completed within a limited time period, this period to be determined by the situation prevailing. Fourth echelon of maintenance includes all operations necessary to completely restore worn or damaged aircraft to a condition of tactical serviceability and the periodic major overhaul of engines, unit assemblies, accessories, and auxiliary equipment; the fabrication of such parts as may be required in an emergency or as directed in technical instructions; the accomplishment of technical compliance changes as directed; replacement, repair, and service checking of auxiliary equipment; and the recovery, reclamation, or repair and return to service of aircraft incapable of flight. -- Army Air Forces in WWII, Volume Six, pp 388-389; Craven & Cate, editors. 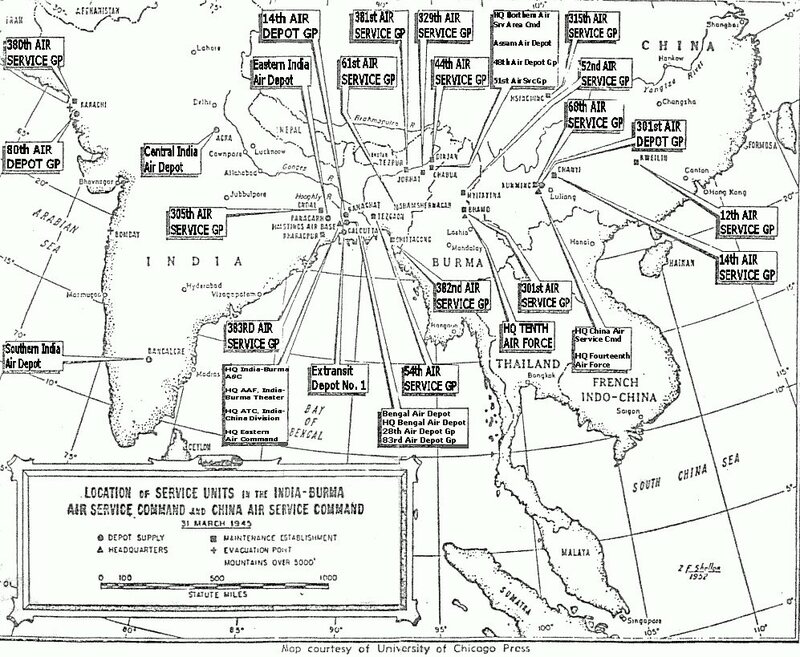 On 4 Jun 42, Air Base Unit Number 2 (inactivated 1 Feb 43 with personnel transferred into 54 Service Squadron) was created by the Karachi Air Defense Area (India) and sent to Kunming, China on 13 Jun 42 with responsibility of furnishing air service assistance to the China Air Task Force which was being organized from the American Volunteer Group (AVG) and tactical organizations. An aircraft factory was established at Loiwing by Curtiss Wright. The organization which operated it was the Central Aircraft Manufacturing Company (CAMC) which negotiated for the employment of members of the American Volunteer Group (AVG). The China Air Service Command was organized to perform all supply and third and fourth echelon maintenance functions for the Air Forces in the China Theater. 14 Air Service Command (Provisional) was activated at Kunming, China on 19 May 43 under Brig Gen Julian F. Haddon. 14 Air Base Command (Provisional) was activated on the same date and assigned to the Air Service Command. 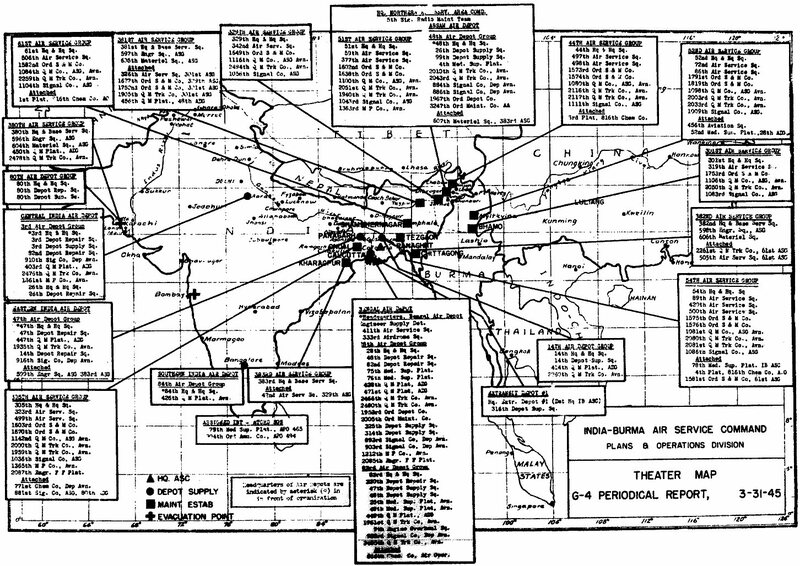 This projected Command was succeeded on 30 Oct 43 by the 5308 Air Service Area Command (Provisional), an area command under the China-Burma-India Air Service Command with Station at Kunming, China. When the 5308 Air Service Area Command (Provisional) came to China in Nov 43, it inherited the 14 Air Service Command. Orders predating the activation placed Col Reuben C. Hood and others on detached service with the China Air Service Area Command (Provisional) resulting in the improper designation of China Air Service Area Command. On 4 Jul 44 Col Clarence F. Talbot replaced Brig Gen Neuton Hood as commander of the 5308 Air Service Area Command. On 20 Jul 44 the command was separated from 14 Air Force and assigned as a separate entity to the Army Air Forces, China Theater. The organization was redesignated as the China Air Service Command as a detachment of Headquarters and Headquarters Squadron, Air Service Command, China-Burma-India. Also on 20 Jul 44, the 5309 Air Service Area Command (Provisional) was disbanded and redesignated as the Northern Air Service Area Command, a detachment of the China-Burma-India Air Service Area Command). On 7 Dec 44, the China Air Service Command (Provisional) was established. The China Air Service Area Command was redesignated the China Detachment of Headquarters, India-Burma Air Service Command. The China-Burma-India Air Service Command was redesignated the India-Burma Air Service Command on 12 Dec 44. This action constituted an important step in setting up an independent China Air Service Command. On 20 Dec 44, the China Air Service Command (Provisional) was assigned to the 14 Air Force and activated 12 Feb 45 at Kunming, China by General Order No. 6, Headquarters, China Air Service Command, dated 9 Feb 45. The Provisional status was removed 15 May 45 when the command was redesignated 14 Air Force Service Command. Headquarters moved from Kunming to Shanghai on 30 Sep 45. It was disbanded on 8 Oct 1948. NOTE on China Air Service Area Command: Sector Number 1 was at at Kunming with eight bases: Paoshan, Yunnanyi, Tsuyung, Chengkung, Yangkai, Chanyi, Luliang. Sector Number 2 was activated 13 Feb 44 at Hsingching. The two sector headquarters were disbanded and four Service Centers were established throughout China: the 68th Service Center was located at Chengkung; the 14th Service Center at Peishiyi; the 12th Service Center at Luliang; the 315th Service Center at Hsingching. Sector Number 3, 5308 Air Service Command, activated 17 Apr 44 with Col. Richard H. Wise commanding. Sector Number 3 was responsible for China Belly Tank project, manufacturing 75 gallon belly tanks for aircraft.